For fans of early Bollywood, it's apparent that the lives and careers of the actresses Sulochana—born Ruby Myers—and Pramila had much in common. Both achieved superstardom in the Indian film industry in an era where Indian women were often not seen outside of the home, both were known for their terrific dancing skills, and both had unprecedented control over her career. But perhaps, most significantly of all, both actresses were members of India’s tiny, yet influential, Jewish population — a community that would transform India’s growing film world. 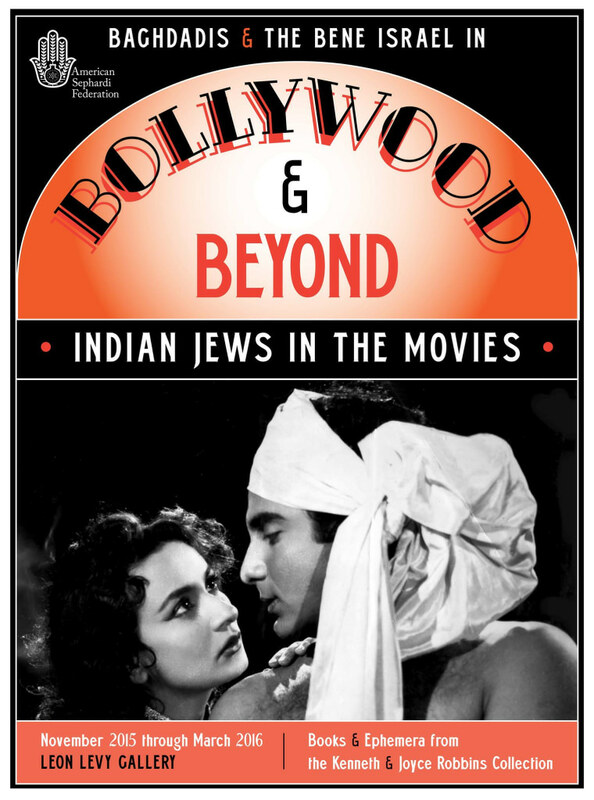 According to Elisabeth M. Stevens, curator of the new exhibit “Baghdadis & the Bene Israel in Bollywood and Beyond” at the Center for Jewish History in New York, “Sulochana was paid better than the Governor of Bombay at one point,” a fact that was breathlessly reported in the Indian press at the time about the actress who would go on to appear in 72 films over the course of her career. “Baghdadis & the Bene Israel in Bollywood and Beyond,” which is on display at the Center for Jewish History through April 1, 2016, explores the role of two of India’s oldest Jewish communities and their influence on show business at the time: the Baghdadis are the descendants of merchants who moved to India from Baghdad in the 18th and 19th centuries; the Bene Israel (which translates to "Sons of Israel") came to India several hundred years before that and were once the largest Jewish community in India. Years before Indian independence, Jewish actresses were creating waves because of their at-the-time scandalous costumes and characters. Part of the reason these women were able to break through in the film industry, Stevens noted, was because they did not have to face the same cultural and religious restrictions many of their counterparts had to regularly deal with. “While the majority of India is Hindu and Muslim, public performance wasn’t considered savory” for women in the eyes of most Indian families, Stevens said. In 1930, Sulochana made headlines when filmgoers saw her do a protracted kissing scene in the film “Hamara Hindustan." “People were shocked there was so such intimacy in public between people who weren’t married,” Stevens said, adding that the concept of kissing on screen virtually "disappeared" for decades after that. A quick glance at Sulochana’s filmography provides a good look at the progressive worldview she championed, with titles like “Typist Girl,” “Cinema Queen,” and “Wildcat of Bombay" — early work that can be viewed nowadays as feminist. As for Pramila, she made a name for herself playing the vixen. “She’d often play very educated women who were supposed to be the foil for a more subservient woman,” Stevens said. But viewers often found themselves drawn to Pramila’s modern characters rather than the traditional housewife-types they were supposed to empathize with. “While the majority of India is Hindu and Muslim, public performance wasn’t considered savory [for women in the eyes of most Indian families at the time]." While Jewish actresses were making their mark in front of the camera at the time, many Jewish male writers and producers were making careers for themselves behind it. But Sulochana's and Pramila's power on-screen extended to behind the camera as well. In an era where most Indian women did not work outside of the home, both actresses founded and ran their own production companies, giving them the kind of control of their careers many current day stars do not have. “They were behind the scenes, writing scripts, and creating music,” Stevens said. She adds that Baghdadi Jews had a long musical history that dated back to their days in present-day Iraq. “There used to be a saying that on Saturdays: there would be no music in Baghdad, because all of the musicians were observing the Sabbath," she said. Because most Indian Jews did not speak Hindi or any local languages fluently, their success in Bollywood peaked at the end of the silent movie era. After the creation of Israel in 1948, many Indian Jews decided to immigrate, while other Jewish artists decided to stay in India and learn Hindi, and continue their careers in the industry. Despite their phenomenal success, it’s possible that most Indian filmgoers had no idea that their favorite stars were Jewish, as none of the top actors or actresses directly identified as Jewish either on or off the screen in interviews, choosing instead to use either Hindu or Muslim stage names. “They never played Jewish characters,” Stevens said.